Manual and automatic bilge pumps, whether submersible centrifugal pumps or remotely mounted diaphragm pumps, cannot completely clear a bilge of water. Typically 1-3″ of water remains. In a shallow bilge boat like the Catalina 25 used for this prototype system, this can lead to a substantial volume of water remaining in the bilge. Water in the bilge can cause serious problems on many boats, including causing wood stringers to rot and internal fiberglass blistering. Bilge water is also the primary source of that distinctive “boat smell”. At the time of writing, there are two commercially available products that address this problem, with advantages and disadvantages compared to this DIY system. The Arid Bilge system is a smart, but relatively expensive system. The more recently introduced Dry Bilge system is smart, but less so than the Arid Bilge, and is much less expensive. The Dry Bilge system appears to leave more water in the bilge than the Arid Bilge system, and appears less robustly constructed than the Arid Bilge system. Both of these commercially available systems are intelligent, only operating their pumps when water is detected in the bilge, which results in less power consumption. As a less intelligent and much less expensive alternative, this DIY system runs on a programmable timer, which draws power on a schedule regardless of whether or not water remains in the bilge. Both of the commercial systems appear to not remove the last remnants of moisture from a bilge because they do not use sponges, and appear subject to clogging at their water pickup points. This DIY system can remove the last remnants of moisture from a bilge, does not tend to clog, and costs less than $100. This DIY system starts with common household sponges, which absorb moisture in the bilge areas. The moisture in the sponges is sucked through small feeder tubing, leading to a simple suction manifold, with the suction generated by an inexpensive DC-electric diaphragm pump. The discharge from this pump can be plumbed into the manual bilge pump outlet hose near where it drains to the through-hull at the transom (Plumbing to the hose near the through-hull at the transom may be considered important for safety. ), or routed to the lifting cable through-hull on swing-keel boats. The pump is controlled by an inexpensive DC-electric programmable timer, which can be installed on the electrical panel bulkhead. For the prototype installation, the timer was programmed to engage the pump for two minutes every six hours, which resulted in a completely dry bilge in all seasons and weather, regardless of leaks and sailing conditions. In this case, the programming could be changed to pump less, such as for two minutes every twelve hours or one minute every six hours. In many boats, there are separate bilge areas in which water typically collects. For the prototype system, there is a separate pickup in each of these areas, a total of three pickups for the system. There is one pickup beneath the forward v-berth, accessible through the wooden hatch beneath the v-berth; one beneath the starboard salon floor, accessible through the small wooden bilge access panel; and one beneath the port salon floor, accessible through the large wooden bilge access panel. Regarding ongoing maintenance, the pickup sponges need periodic replacement when they begin to deteriorate, at least annually in this prototype system. Allowing the sponges to deteriorate could cause the tubing to become clogged with sponge debris. A note about pickup-to-manifold tube sizing: four different internal diameter tube sizes were tested, 1/16″, 1/8″, 1/4″, and 3/8″. The 1/8″ internal diameter tubing yielded the greatest volume of water removed when one of the sponges was wet while one of the sponges was dry, which is likely to occur in this system. A version of this article originally appeared in the November 2017 Catalina Yachts owners’ magazine, Mainsheet. This is a repost from http://www.nacra-na.com/about-us.html in case the original page goes dead like so many others. (California) 1968, Geoff Prindle decides to get into catamarans. That year he founded Surfglas with his partner, Sterling Santley. He really got into the catamaran scene heavily and placed second at the USA nationals. 1971, Prindle 16 goes into production – light, strong and fast. The Prindle could cut smoothly throgh the water because of its fine bow entry and was not as susceptible to pitch poling as other similar designs. Two years straight, the boat won the “Most Efficient Catamaran Trophy” award at the Pacific Multihull Association’s World Speed Trials. 1972, NACRA started out as an Alpha cat beside Prindle. The first boat was the Alpha 18 and then the Alpha 15, which was a single handed boat and went on to sail in the One of a Kind regatta in Newport Beach. Within this time frame, Tom Roland made a 18 foot cat that became the Nacra 18 square. 1975, Performance Cat Inc. came up with the NACRA 36 to promote the North American Catamaran Racing Association which is where the name NACRA came from. A 36 foot speed machine did lots of promotion and is still going strong. The NACRA 5.5 was born as a one up cat. NACRA in the early 80’s developed the 5.0 to also sell cats in the recreational market and this was quickly followed by the 5.7 and 5.8. 1985, Roy Seaman made all the original NACRA hull plugs and also developed the 6.0 to be the ultimate boat especially for the Worrell 1000 Extreme race. The NACRA 6.0 won this race numerous times. The first NACRA 6.0’s had a self tacking jib and spinnaker. At the end of the eighties the 5.5 rig was changed into a sloop. 1996, The formula 18 class was growing in Europe so NACRA launched the Inter 18. For the NACRA Inter 20, it was only a matter of time. Once in production, they were sometimes sold by the dozen. By now, importers and NACRA dealers all over the world were distributing NACRA catamarans an NACRA was super successful in racing and recreational sailing cats. The 21st century – judge for yourself where the history of NACRA has led us to today. NACRA supplies boats and parts in large numbers through it’s well established dealer network around the world. Whatever type of NACRA you might be interested in, we will always supply you with the best product available. In May of 2012, NACRA reach the highest possible standard when it was chosen by elite sailors of the world as the exclusive Olympic Mulithull. We will soon witness how the NACRA 17 will shine during the upcoming Olympics in Rio de Jaineiro, Brazil in 2016. In 2015, NACRA will celebrate its 40th YEAR anniversary! Poli Glow is available on Amazon here. You wear them while cleaning your boat’s deck with bleach or a similar chemical. Bleach “dries out” many rubber polymers. In years past, celebrating race car drivers and burnout enthusiasts applied bleach to their tires to quickly “dry” and harden the outermost edge of their tires’ rubber, which would cause the tires to loose traction easier and make doing burnouts easier. You only wear them while on your boat(s), so that the outermost portion of the hardened sole never wears away. At the U.S. Sailboat Show in Annapolis this past October, Catalina Yachts staffers mentioned a new project, the Catalina 425, which would return Catalina to the three stateroom sailboat market. On November 2, Catalina issued a press release announcing the Catalina 425 will be available in the spring of 2016. The boat’s interior arrangement comes with three staterooms. The Catalina 425 is a very attractive design, styled with modern lines yet remaining conservative in Catalina’s fashion. The 425 has high topsides with little flare and large fixed rectangular portlights, a nearly plumb stem (purportedly raked aft only enough to keep anchors clear), a broader stern, and a clean deck profile. The sheer line of the deck and flare of the topsides should make for a relatively dry ride. Many sailors will appreciate that the hull has no chine as has been fashionable in sailboat design lately. Although Catalina is calling the 425 one of their 5 Series boats, the 425’s topside and deck styling and port configuration are dramatically new and different. 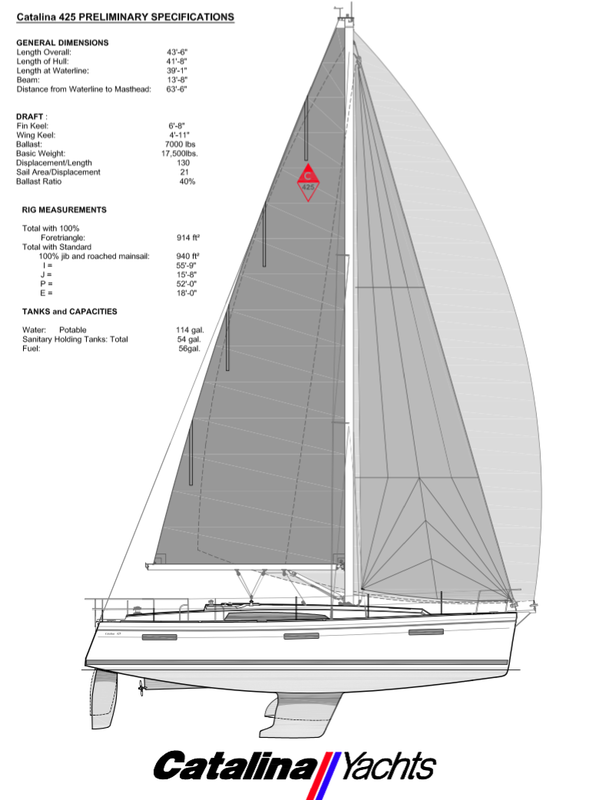 The Catalina 425’s design may signal a welcome change in direction for Catalina’s 5 Series design aesthetics. The Catalina 425 includes a substantial systems area between the aft staterooms, extending from the companionway nearly to the stern. In addition to providing excellent engine and systems access, this space will provide more sound privacy for aft stateroom residents than is found in most modern production boats that have only a thin partition between aft staterooms. Presuming Catalina continues to use traditional materials below decks on the 425 as they do with their other boats, these substantial materials will further add to aft stateroom privacy. The Catalina 425 deck is incredibly clean. Side decks are unobstructed by shrouds, genoa tracks, or anything else. The foredeck is a perfectly sized space for working with a foresail. The Catalina 425 has a large hatch in the stern, which can be used like an inflatable dinghy garage. There is a retractable swim platform. The starboard cockpit bench converts to a double berth. In the port cockpit bench is a “gull-wing” hatch that opens to the port aft stateroom, enabling this space to be easily used for a lazarette. The Catalina 425 is designed with Catalina’s Strike Zone, a watertight crash locker, or collision bulkhead, in the bow. Crash lockers are crucial safety features that are obvious but rarely included in production boats. They are not expensive to produce and only take up the least valuable and infrequently used space below decks. All cruising sailboats should have crash lockers in the bow, and if not provided by the manufacturer, should be retrofitted. The Catalina 425 has a lead keel, which better absorbs the impact of grounding than less expensive keel metals found in most production sailboats. The 425 also has an extensive load bearing grid work in the bottom of the hull, which in addition to preventing hull flex, distributes keel loading and impact forces in the event of grounding. A shoal draft keel and rudder will be offered. Being a 5 Series boat, the Catalina 425 hull is laid up with Catalinas 5 Series system. The Catalina 425 has a deck-stepped mast that is well-supported by Catalina’s T-Beam MastStep, which effectively transfers the mast load to the keel. The backstay is split, which of course eases boarding from the stern, and the spreaders are swept back. Unlike older Catalina’s the 425 is a fractional rig. Shrouds are inboard, mounted to the deck at the edge of the cabin house. The mainsail is roached with vertically oriented battens. The standard 100% jib is self-tacking on a traveler track mounted on the cabin house. Genoa tracks are set farther aft, inboard along the base of the cabin house. The genoa is tacked to the forward end of the anchor roller bow sprit. The inboard shrouds and sheeting should allow the Catalina 425 to point well to windward.